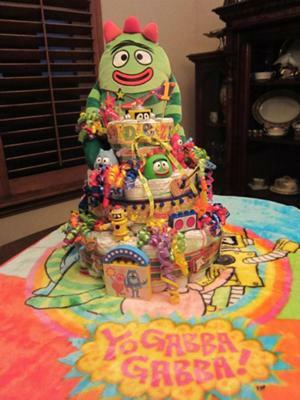 This Yo Gabba Gabba diaper cake is a huge hit! So many colors and decorations -- "pink and happy" as Foofa would say! 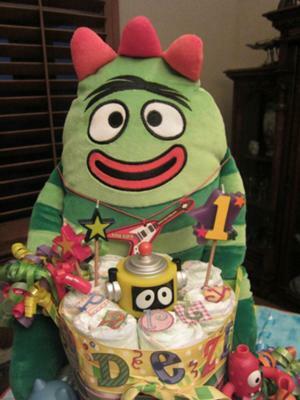 Lorie created a masterpiece diaper cake for a 1st birthday party. Such a fun idea :) I am smitten! Our readers like Lorie are incredible - creative, clever and caring! They submit their diaper cake ideas to share with the world and they don't ask for a thing in return...truly paying it forward. 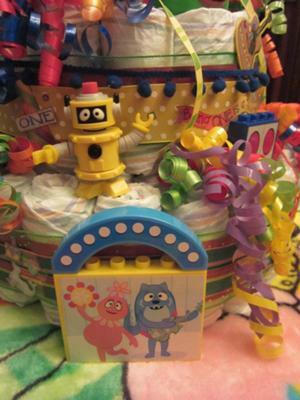 Thanks a million for sharing your diaper cake Lorie, it is amazing! 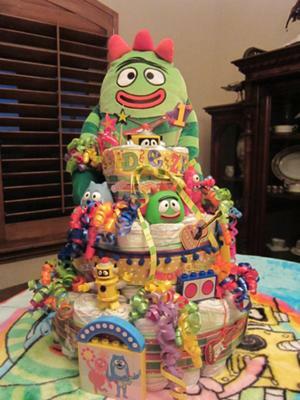 Submit your diaper cake to our photograph gallery, right here. Used #4 diapers, Most of the little pieces of Yo Gabba Gabba I found on the internet. He is only 1 year old so some of the pieces are lego which are too old for him so I gave the Mom the box to put away until he is old enough. The ribbons and the stickers came from Michaels. The curly ribbons came from the dollar store. I used a bottle of sparkling cider in the center.